McKees Rocks native Paul Spadafora held the IBF Lightweight title for almost four years more than a decade ago, appearing regulary on ESPN and HBO. But his life out of the ring and his addictions eventually caught up with him. In 2005, Spadafora served a 13-month prison sentence for attempted murder, and the last six years have been spent on a roller coaster ride that saw more victories in the ring but continued trouble outside it. 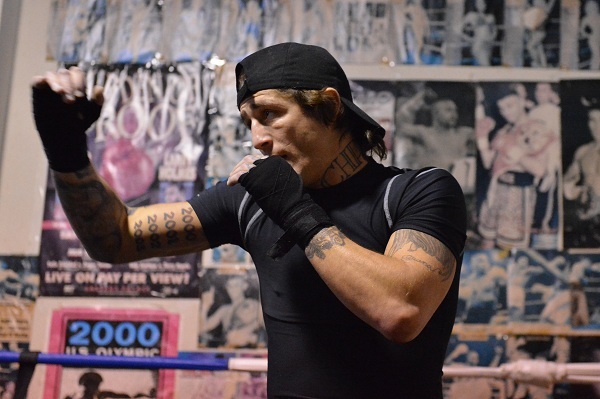 Earlier this year, after a lengthy stay in rehab, the 37-year-old Spadafora reunited with Ambridge trainer Tom Yankello, who guided him to his greatest periods of boxing success. In August, the pair teamed up for a victory over Humberto Toledo and now have their sites set on a Dec. 1 bout with top-15 contender Solomon Egberime. 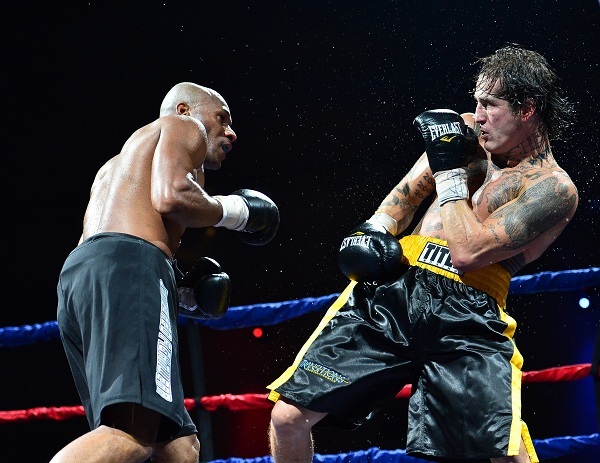 The newly-sober Spadafora is eyeing a big 2013, and a win over Egberime will be a big step toward another chance at a title. 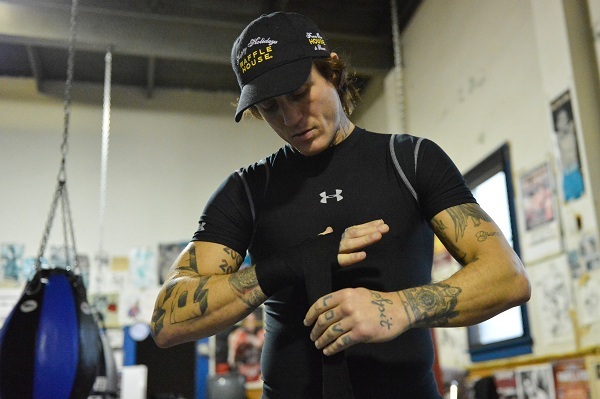 PSR Editor Tony DeFazio stopped by Yankello's Ambridge gym, where Spadafora spoke candidly about his past, his future and the long road through it all. DeFazio: Are you a different fighter now that you were when you held the belt? Spadafora: I feel like I definitely am. I feel like I'm more relaxed, more settled down. I'm punching a lot harder and I don't waste too many punches. I'm just smarter in the ring now, I'm more experienced. I'm a veteran in the ring now. DeFazio: How much of that has to do with your life outside the ring now? Spadafora: Most definitely... (laughs) That's probably about 100 percent the difference. I ain't never been clean this long in my life, you know what I mean? I'm just living a different life. I'm just more mature, man, and my perspective has changed in life and so it definitely changed in the ring. My way of training changed, my way of resting changed... I'm just a whole different guy. DeFazio: Does boxing hold a different place in your life now? Spadafora: Well... I love boxing, man, I love boxing with all my heart... (long pause) That's a good question. I guess a little bit. A little bit. DeFazio: Was there ever a point during your long road back where you thought it was going to be too much, and you thought about packing it in? Spadafora: I never, ever thought I wouldn't do this again. I always knew I'd be fighting. No matter where I was, I always knew I was going to be in the ring again. DeFazio: What is it about your relationship with Tommy that seems to bring out the best in you in the ring? Is that even a fair statement, that he brings out the best fighter in you? Spadafora: He definitely does, man, he definitely does. I always wanted to be here. I never wanted to go. I never wanted to be away from Tom, I never wanted to be away from him. But people in my life changed and the way I was changed; I was really vulnerable as a young kid. But it's about me, it's about Paul right now, and Tom makes me happy. I love being with Tom, I love training with Tom, I'm on the same vibe as Tom. Tom puts me back where I need to be. Square one, you know? Nothing has changed from back in the day. I was with Tom years ago, 1999, and nothing has changed since then. Tom's a good guy, man, and Tom cares about me a lot. He cares about my well-being too. My relationship with him makes me want to be better. He makes me want to be better in the ring and he makes me want to be better as a person, you know what I mean? I don't want to let him down. That's someone that I don't want to let down and before it was just... different. I don't want to let myself down now and I don't want to let the people that I'm around down either. Like now, I'm in the gym and I'm just so grateful to be here now, and it makes me want to work hard and it makes me want to do the right thing. DeFazio: You've had your detractors and you have your supporters. Do you get motivation from any of that? One or the other? Spadafora: I do. I want to prove to myself, but I also want to prove to the world that I'm the real deal... you know, someone will show me some little blurb on the computer where someone will say something about me, and I'm just like, "Wow this m-----f----- don't know that I'm the truth." And with what I got going on now, I'm going to have the chance to prove that. I'm gonna get a chance to prove that I'm the truth. DeFazio: You've got a big fight coming up Dec. 1, but what are your goals in the ring beyond that? Spadafora: To stay busy, to be in the ring. To be in the ring three or four times next year and be fighting for the world title, or be fighting somebody who's supposed to be somebody and be in the big payday. Get a big payday for my family, and that's it man - be a well-respected boxer, be on HBO, be on Showtime or whatever it is. I wanna be in the ring with somebody who's supposed to be somebody. DeFazio: You once told me your only goal after boxing was to sit around and get fat. Have you allowed yourself to consider what your legacy will be now, after everything you've been through? Spadafora: Here's what I think, here's what I feel in my heart: I think it's going to be one of the greatest comeback stories in boxing history. I know the history, I looked at what happened to Jim Braddock, I seen this story and that story, but I been down in the dirt, man. I was out. I was out for the count. I was in the penitentiary. I was in a position where I was shot. My life has been ups, downs, ups, downs. And now it's up. And this is the last road. And this is the road that I chose. I went to the rehab and I said "F--- everything." That's what I said. "F--- everybody and everything and I'm gonna take this time to get right with me." And that's what I chose. And this is going to be the biggest comeback in boxing history. DeFazio: You're passionate about this, man. It's pretty clear. What makes you believe so much? Spadafora: When I'm running, or when I'm in the ring sparring and guys are punching good, and I'm slipping them and I'm like, "Whoa, missed me," (laughs) and that all just makes me realize, when I get home and lay in bed, that I'm just thankful to be here. (Looks up) Thank you. Thank you for giving me another chance and thank you for keeping your hands on me because I was so f----- up. People don't even understand how f----- up I was. I was gone. It was just like, man... boxing? Man that was just in my imagination. I dunno... You know... you know when you're happy? And, I don't know, you just feel better? Well I perform better. I get sleep now. I'm sleeping, I'm resting, I'm eating right, I'm living right and the people that are around me are the right people. They're not negative people. And my body's coming back; my s--- is still here. I can still move, I can still make you miss, I can feel that I can still do this stuff. And when you ask me about legac y, it's going to be a story where my son--anybody's kids, especially the ones from poverty like where I'm from--no matter what, man, you can come back. No matter what. And you know who holds that key? You and God. And it's up to you. You have to get with yourself, get with God and then you have to go about doing it. I have (a tattoo) on my neck, "The Chosen Few," and honestly... I get emotional about this, but I went to that rehab... and who would have thought that I'd go to rehab and somebody would be trying to actually help ME? Because not everybody gets help. Not everybody has someone who says, "Let's take a special interest and let's pull this kid aside. Not the boxer, just this guy. Let's pull him aside and let's talk to him. My sponsor, my counselor... people who told me, "You deserve better than this." Not everybody gets this. The way I look at myself now, I deserve to be fighting and I don't think, "You can't do this." Now I think, "No, you can do this." I had to find myself. You know how life is, Tone, you know how it is. I'm just on a different road now, my mentality and the people around me, I'm just on a whole different vibe. I'm blessed and I just want to take this and run with it. You got a second? Just to come over here for a second. Look out this window, man. I did everything I ever wanted to my whole life, I really did. I was world champion, fighting on HB0. Then I'm in the penitentiary. Surrounded by a bunch of dudes. I'm just some little white guy covered in tattoos, staring out the window through bars looking at the yard. How'd I let myself get here? How did I go from world champion to sleeping under a dude's porch? From champion to robbing people, robbing drug guys who I thought deserved it, you know, they were the bad guys, the bad people. I was f----- up on (drugs and alcohol). That's the truth. That happened. And you can come back from that. I did. I'm back. I look out this window a lot now, and it's a football field, man (laughs). You know? So what do you want me to be mad about?? How can I complain? Bad days don't come around too much anymore.